Add this small underwater light to your indoor fountain to create a beautiful lit display. This underwater light is perfect for smaller table top fountains. It comes with 6 foot cord and low voltage transformer. 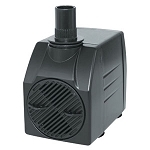 The American Pond fountain heads fit the American Pond fountain pumps JR1100 through the JR3500. Each Fountain head box comes with 3 fittings that allow for 4 fountain effects. Geyser, Waterbell, Volcano, and double Volcano.